CarGurus has 24,907 nationwide Forte listings starting at $2,495. The Forte’s interior aesthetic is head-of-the-class, and that's backed up by a layout and functionality that asserts itself as a more-than-competent vehicle for everyday driving. Kia has come a long way. For the majority of its 20-plus-year presence in the North American market, the Korean automaker moved vehicles under a bargain-basement approach, dealing no-frills rides at corresponding base prices. In Kia’s campaign to develop a lineup of truly competitive and modern vehicles, it unveiled the Forte in 2009. The first-generation Forte was a compact sedan and coupe intended to seriously compete with the likes of the Toyota Corolla and Honda Civic. Yet the first Forte was a case of “almost there,” and buyers did not flock as much as Kia had hoped. 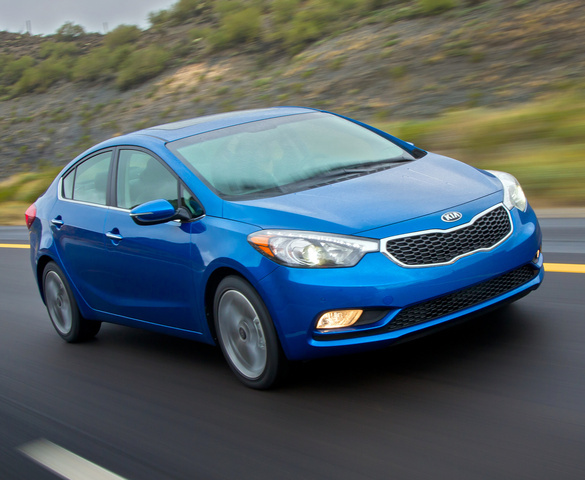 The 2014 Kia Forte is a far more complete and competitive vehicle than its predecessor. In fact, the new Forte has the style, space, efficiency and in-car tech to put it right up there with the best in the small-car game. 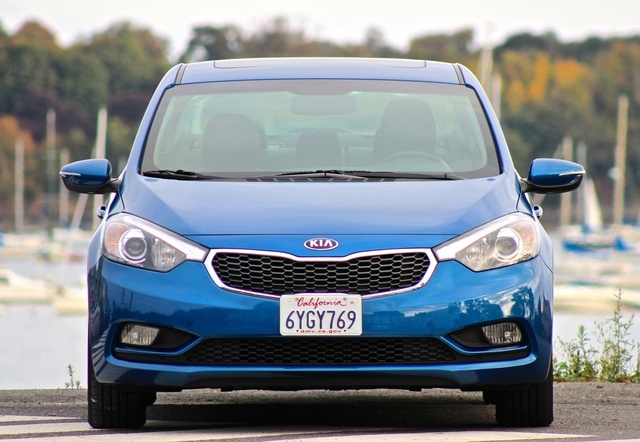 With its 2014 model year redesign, the Forte is instantly a front-runner among compacts. Although somewhat more rounded (for packaging reasons), the Forte sports an aggressive appearance, including the large H-pattern grille and raked LED headlights. A “scalloped” line runs between the front and rear wheels on either side of the vehicle, adding some character to the Forte. When combined with the Abyss Blue exterior color of my test car, these elements result in a vehicle that appears to be in motion, even when at rest. Inside, the Forte boasts a modern and attractive interior that is packed with features, but won't overwhelm the driver with controls. The modern and mechanical interior aesthetic feels derived from an Audi or BMW—high praise indeed. Although the fit and finish don’t live up to the interior appearance, they are still exemplary for a small car. Our EX test model even had faux carbon-fiber inserts in the dash. The leather seats of the EX were also worthy of the top-level trim. They were firm without being uncomfortable, bolstering the driver well through turns. Standard seating fitments are up to snuff as well and remain a comfortable place to park one’s derriere when stuck in traffic for extended periods of time. In the compact car segment, heart-pounding acceleration and handling are not necessities. Some automakers offer performance compact variants, like the Volkswagen GTI and Ford Focus ST. All that is truly needed from a compact is to get up to highway speed in a safe distance and to be able to maneuver out of harm’s way. 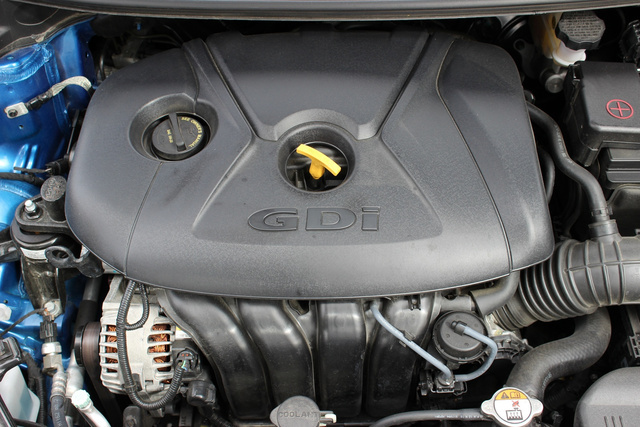 The base LX Forte is equipped with a 1.8-liter inline 4-cylinder, making 148 horsepower and 131 lb-ft of torque. Power is sent to the front wheels through either a 6-speed manual transmission or a 6-speed automatic with tap-shift function. This combination is just barely acceptable as a powertrain for a vehicle that weighs nearly 3,000 pounds. If you don’t want to feel like a hamster wheel is under the hood, opt for the EX. Its 2.0-liter 4-cylinder develops 173 horsepower and 154 lb-ft of torque. Not a hot rod by any stretch, but you won’t feel like every pass on the highway needs to be planned minutes in advance. The 2.0-liter is paired to the 6-speed automatic with tap-shifting. When you need to pass on the highway, the tap-shift function allows the driver to downshift to the proper gear to make a move faster than the car will shift on its own. As for fuel economy, the smaller 1.8-liter engine achieves 25 mpg city/37 highway when paired with a manual transmission. Opt for the automatic, and expect 25/36. The 2.0-liter in the EX achieves 24/36. In short, you will not be penalized very much on fuel economy for the added power in the EX. Its rating of 27.8 mpg combined backs up that notion. One of the Forte EX's big surprises was that it was actually fun to drive. The seating position allowed for an athletic posture when making turns. A little button on the steering wheel can actually change the steering feel. It is called FlexSteer and is a byproduct of the electric power steering system. Compared to a conventional hydraulic steering system, it uses less power, but with FlexSteer, you can also customize the steering feedback. Drivers can select between Normal, Sport and Comfort. Normal is great for everyday driving, while Comfort maximizes steering assist to minimize driver effort in maneuvers like parallel parking. Sport minimizes steering assist so the driver feels much more connected to the road. On some of New England’s back roads, the Sport mode provided a spirited setup that made the Forte a fun little car to drive. If 173 hp just doesn’t satisfy your need for speed, rumor has it that a turbocharged inline 4-cylinder will be available and will make 201 hp and 195 lb-ft of torque. Unfortunately, this engine is planned for use only in the 2-door Forte Koup and Forte 5-Door hatchback at the time of writing this review. The Base LX commands a long list of standard features, including body-color heated fold-away side-view mirrors, an AM/FM/CD/MP3 stereo with a 3-month subscription to SiriusXM satellite radio, Bluetooth connectivity, USB auxiliary audio input, power windows with driver's one-touch automatic operation and a host of other gear. The standard 60/40 split-fold rear seats are easy to lay down by simply pulling on clearly labeled toggles in the trunk. When folded, it provides adequate space for skis, golf gear or a friend’s entire wardrobe. The LX Popular Package includes 16-inch tires with alloy wheels, remote keyless entry with trunk opener, cruise control with steering-wheel-mounted controls, a sliding center armrest, power foldaway side mirrors with built-in turn signals and a pair of speakers added to the stereo. 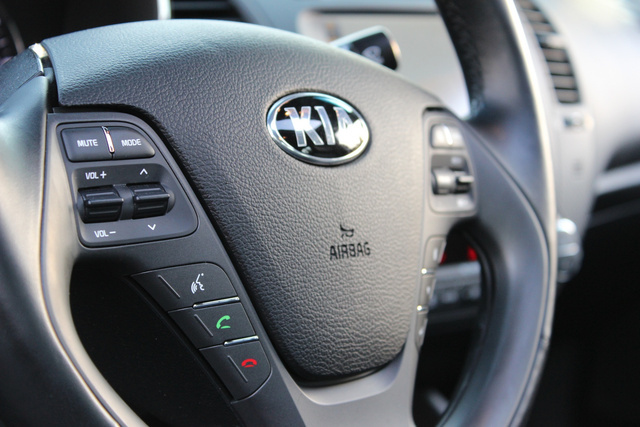 Kia offers standard Bluetooth connectivity, allowing you to place calls and access music wirelessly. For many, that single element is huge, as you never have to take your phone out of your pocket for music or calls. Unfortunately, it’s not all rosy. The centerpiece of Kia’s tech front is its UVO (pronounced You-VOH) infotainment system. It is unavailable on the LX, but standard on the EX, and methinks it is too smart for its own good. UVO was co-developed with Microsoft, and anyone who has used Ford’s Sync can tell you that the tech giant may not be the best at grasping in-car functionality. When paired to my smartphone (for reference: an iPhone 4S with the iOS 7 update), playing music was hit-or-miss. For the first day of driving, it worked without a hitch, but after I plugged in the USB connector so I could charge while operating, the system must have become overcome by the redundancies of Bluetooth and USB connectivity. After that, songs would jump around, and trying to change tracks from either the Forte’s digital screen or my phone didn't always work. The beauty of a system like UVO, however, is that it can be “re-flashed” with the latest software update. If the iOS update did, in fact, create issues, Kia can make updates to resolve them. Such a practice can go on for the life of the car, so even when the Forte has exceeded its 10-year, 100,000-mile warranty, it can receive an update so that it can run the same user-interface software as the 2024 Kia Forte. All in theory, of course. 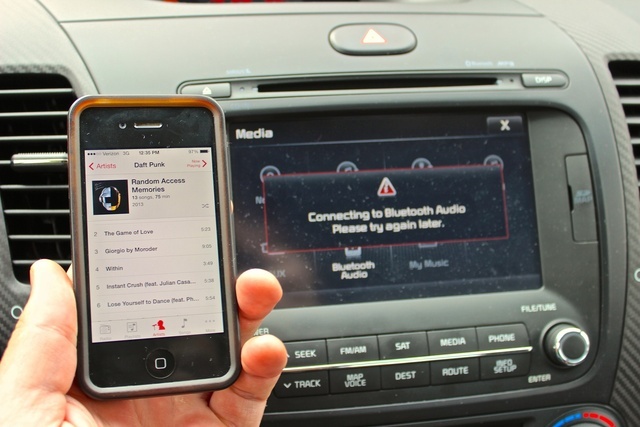 More practically, the voice-activated navigation system performs exceptionally well. It operates through the same vibrant color touchscreen as other vehicle functions. Unlike systems of the past, where the driver had to deal with several layers of menus, locating city, street and house number as separate steps, this system allows for complex navigation commands. The driver can simply press the voice-control button and say, “Set destination: 4 Yawkey Way, Boston” and the Forte will navigate to Fenway Park. There are a myriad of other voice commands, but this singular ability to enter an entire address as once sentence will be used more than any other in the Forte’s arsenal of tech features. The Forte comes equipped with a host of front impact and side curtain airbags, 4-wheel antilock disc brakes, electronic stability control, traction control, braking assist, hill assist control, electronic brakeforce distribution, front and rear crumple zones, side-impact door beams and a tire pressure monitoring system. More than anything else, Kia has stressed through its vehicles that safety should not be an exclusive luxury. In crash testing by the Insurance Institute for Highway Safety, the Forte earned a rating of Good for side impact, roof strength and moderate frontal offset tests. In the same round of tests, the Forte earned a Poor rating for small-overlap frontal offset crashes, in which the vehicle’s front corner would collide with a tree or utility pole at speeds of 40 mph. That score was not enough to detract from its overall safety credentials, and the IIHS named the Kia Forte a Top Safety Pick. 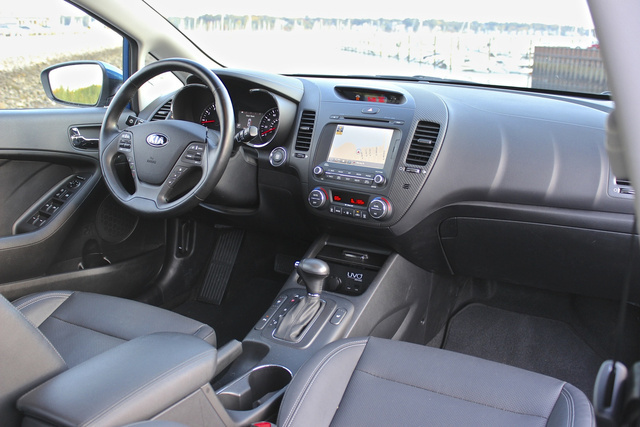 With a starting price of $15,900 for the base LX with a manual transmission, the 2014 Kia Forte offers quite a lot. Only the Nissan Sentra is as inexpensive, and competitors like the Chevrolet Cruze and Honda Civic carry a starting price closer to $17,000. Those that can’t operate a manual (or don’t feel like using a stick-shift on a daily basis) will have to fork over another $1,500 over base MSRP. Our EX test model came with the optional Premium package and Technology package selected, and it still clocked in at under $25,000 before destination. It is a solid deal considering the long list of features that come with a fully optioned version. With the previous Forte, Kia proved that it understood what it would take to make a competent small car; it was just off the mark on the execution. 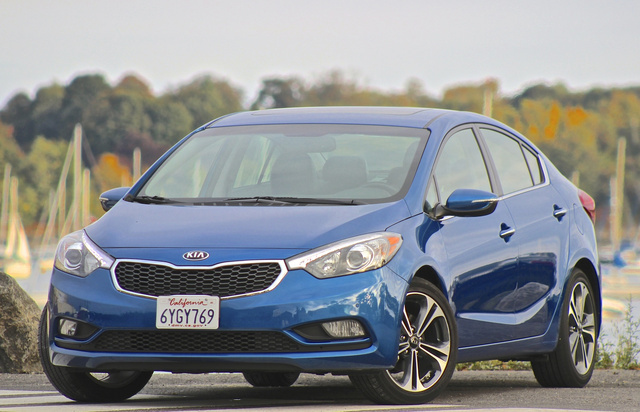 Now with the 2014 Kia Forte, it is evident that the Korean automaker has vastly closed the gap with competitors from Japan and the United States. 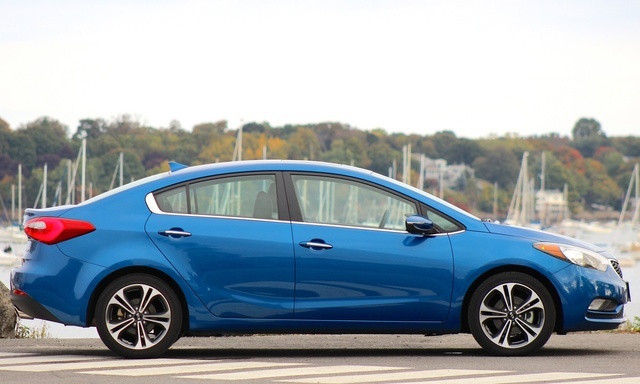 What's your take on the 2014 Kia Forte? Have you driven a 2014 Kia Forte?